The Davidson Brothers Band from Australia, led by the multi-instrumentalist brothers Hamish and Lachlan, will be at this year's European World Of Bluegrass (EWOB) Festival in the Netherlands, appearing on 4 June. 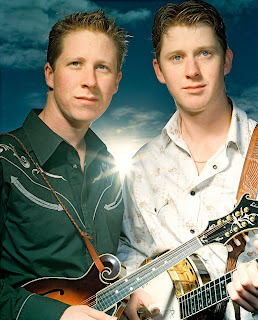 The Davidson Brothers Band have performed three times at IBMA's Fan Fest in Nashville, TN, and their latest CD, Born to play, features many guests from among the leading ranks of US bluegrass musicians. Their visit to EWOB is the band's first trip to Europe, so they will welcome any useful contacts and any chances of playing other shows while they are here. You can contact the Davidson Brothers by e-mail. 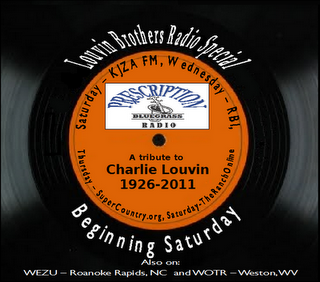 Following the sad news of the death of Charlie Louvin on 26 January, the Prescription Bluegrass Blog announces that Prescription Bluegrass Radio (USA) will present a special record programme in tribute to the Louvin Brothers. The fifteen tracks chosen for the programme begin and end with recordings by the Louvin Brothers themselves, together with covers of their songs by many bluegrass artists, including 'Dark as the night' by the Czech band Sunny Side. Further details can be found here. 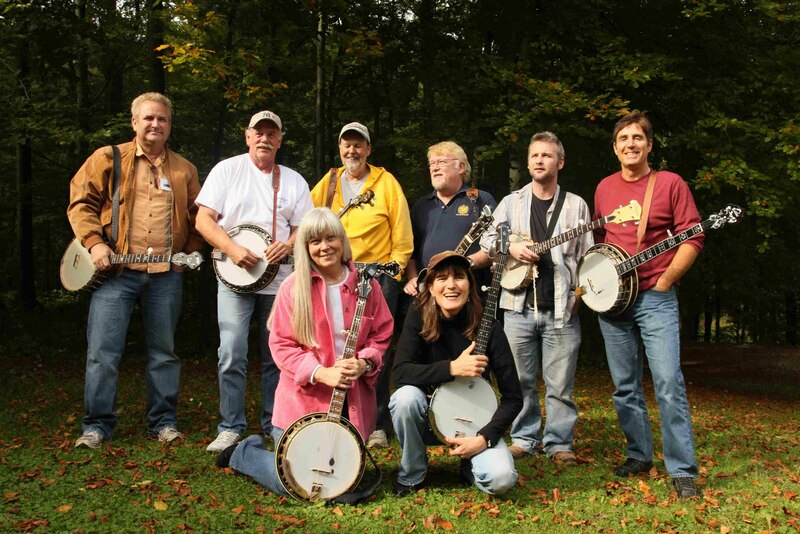 A reminder that the Tennessee Mafia Jug Band (USA) will be performing at the G! Festival in the Faroe Islands in July 2011, and would be glad to know of any other opportunities to play in Europe around that time. 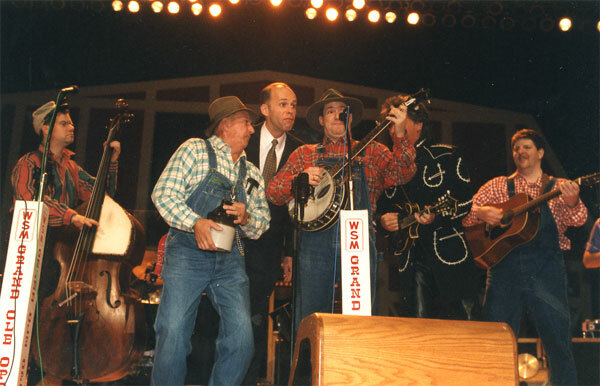 The band, which performed with great success a few years ago at the Johnny Keenan Banjo Festival in Longford, Ireland, consists of 'Lonesome' Lester Armistead (jug), Leroy Troy (banjo), David Ferguson (bass), Dan Kelly (fiddle), and Mike Armistead (guitar). Contact Mike himself by e-mail, or the band through their website. The EBMA's 10th anniversary jubilee concert (co-presented by the German Bluegrass Music Association) (GBMA) will be held in the Bürgerhaus Neuer Markt, 77815 Bühl, Germany, on Saturday 19 Feb. 2011, starting at 19:00 and featuring Monroe Crossing (USA) (ending an eight-day tour in Europe), 4 Wheel Drive (D/NL/B), and G-Runs 'n Roses (CZ). 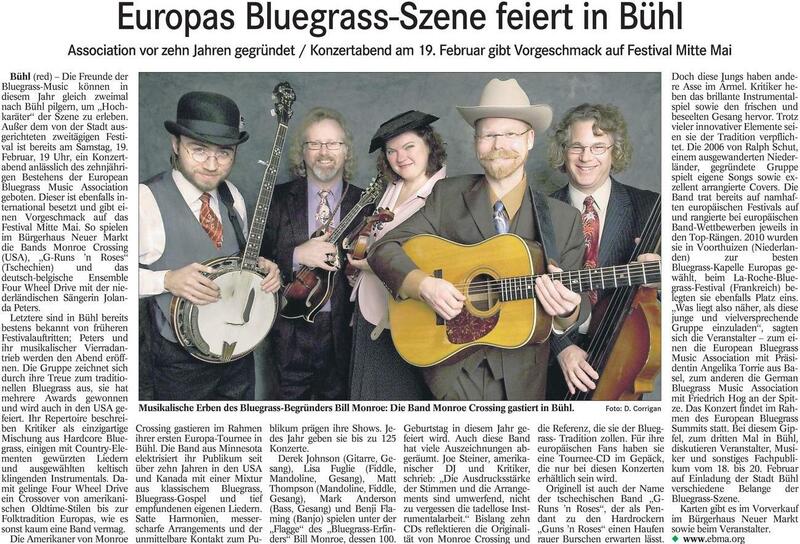 The concert also marks the third European Bluegrass Summit (18-20 Feb.) and the GBMA's first year in existence. More details are shown on the poster (left) and the EBMA homepage. Plenty of tickets are still available: you can book online through the EBMA website. The NAG newsletter, in pdf format, can be viewed here or downloaded. TinkaBelle is a promising new singer in the Swiss music scene. She was at the right place at the right time and was discovered by major label Warner Music, who incidentally just then reopened their offices in Switzerland and were looking for something suitable to start with…. A contract was immediately signed for four countries (CH, D, A, PL) and in addition the 29 year old was invited to record a duet with smooche singer Seal. She describes her music as country music influenced pop, and people seem to like it, „The Man I Need“ is heard on the radio every now and then each day lately. 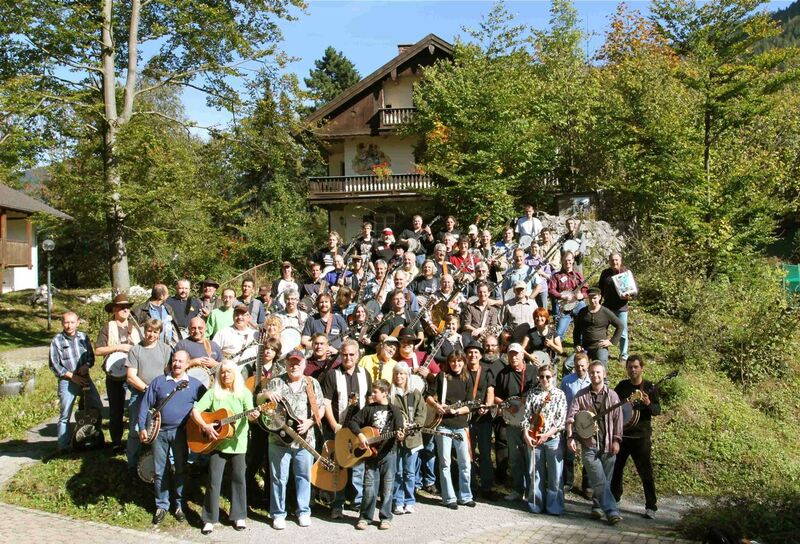 With a first CD featuring some banjo sounds and surprised by the success, TinkaBelle searched for a banjo player to join the backup band for the promotion tour starting in November 2010 – and they found Andreas Kaeppeli, the talented Sunny Mountain Grass banjo player. One of the first „big“ performances was at a very popular Thursday late night show, where Tanja was interviewed and they played a short version of her first release song „The Man I Need“ (check out the link: the musical part begins at 8:57). 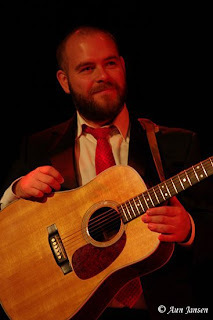 Currently on promo tour – with 30 short gigs in Switzerland in January – Andreas is doing great PR for bluegrass banjo and our music and we’re really proud of him! Check out TinkaBelle on Facebook for some great pictures with a 5-string! And here’s some more music: „The Man I Need“ and „Hold On“. Good luck to TinkaBelle and banjo picker Andreas Kaeppeli – you can see him with Sunny Mountain Grass on 13 May as opening act of the 9th Int. 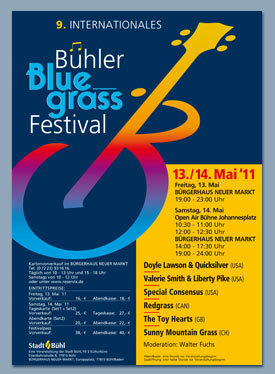 Bluegrass Festival in Buehl and prospectively at some of the long running Swiss Bluegrass Festivals (check out band schedule for more). 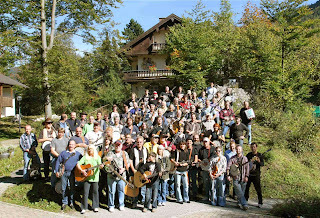 A record attendance is expected at the 3rd European Bluegrass Summit, which will be held in Bühl, south-west Germany, on 18-20 February 2011. Forty people from eleven European countries (ranging from Ireland to Russia and from Norway to Italy) and from all fields of bluegrass activity, are now registered to attend. Germany and the Czech Republic are particularly strongly represented. Dwight Worden, the IBMA board member for associations, will be attending from the USA. The Summit is also highlighted by the EBMA 10th anniversary concert (co-presented by the GBMA). Details are shown on the poster (left) and the EBMA homepage. Plenty of tickets are still available: you can book online through the EBMA website. The 3rd European Bluegrass Summit will be generously hosted again by the city of Bühl offering the entire meeting facilities and infrastructure for free. Full details of the Summit are on the Summit section of the EBMA website. Thanks to Robin at the UK Tin Angel Records label for the news that US old-time country blues musician Charlie Parr (National steel guitar, 12-string guitar, banjo) will undertake a short tour of Europe in the latter half of February 2011, with dates in Ireland, England, Belgium, and France. You can find all the relevant information here. We got nominated for a Spellemann which is the Norwegian Grammy Awards. We're nominated for our album [right] in the category of Best Country Music Record. Here's one happy bunch at the press conference. Our first bona fide 'cheese' photo [above]. We were also invited to play at the main European bluegrass festival event of the year, EWOB 2011, which will be held in the start of June in the Netherlands. Our showcase will be on 4 June. As if this wasn't enough - we've also been booked to play at the renowned Finnish Roots Festival Rootsinpyhtaa 2011 in early June. Rootsinpyhtaa is the largest Finnish festival for bluegrass and roots music, and has existed since 1988. They've housed well known artists through the years like Don Rigsby, Tony Trischka, Hot Rize, and the list goes on. A perfect summer kickoff! The blog now has some additional fancy features, as you can share articles through all those neat social networks. You can also be a 'follower' of the blog if you have a Google account, or you can follow EBMA on Twitter @ebma_tweet and get notified about new posts and other news. For news you want to see on the blog, feel free to send an e-mail to us. Please format in plain text and send pictures as an attachment. 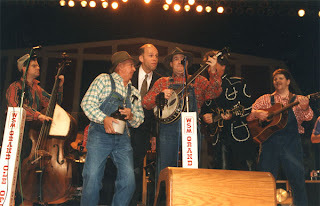 The IBMA has just announced the names of the twenty-five members of its Leadership Bluegrass class for 2011. This year the only member from outside the USA will be Angelika Torrie (left), chairperson of the EBMA. The course will be held in Nashville, TN, on 8-10 March 2011. 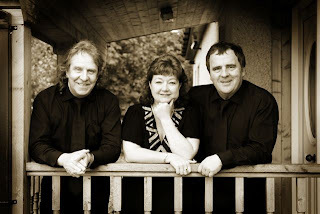 Other members who are well known to bluegrass enthusiasts in Europe are Greg Cahill, whose band Special Consensus is now on tour in Ireland and Britain and will be playing in Continental Europe in May; and Tom Nechville of Nechville Musical Products. The full list of class members of LBG 2011, together with other details of the course, can be seen here. 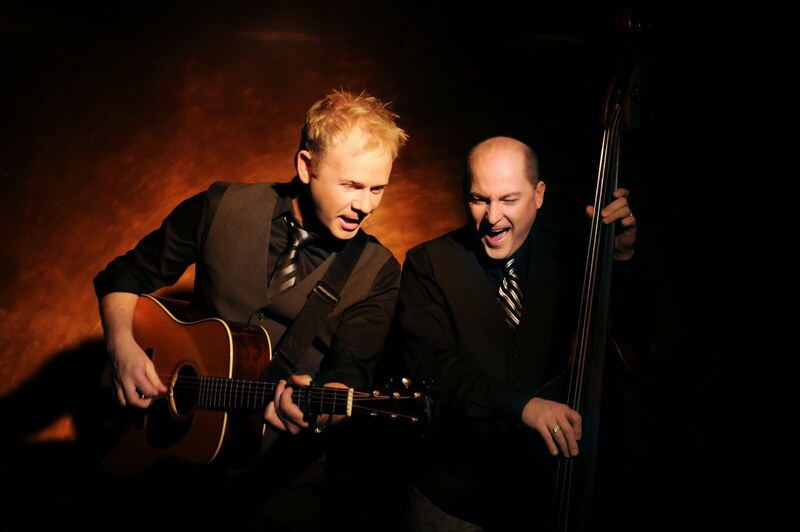 The multi-award-winning Dailey & Vincent (USA) will be the headline act for this year's Appalachian & Bluegrass Music Festival (2-4 September 2011) at the Ulster American Folk Park, Omagh, Co. Tyrone, Northern Ireland. They are also booked to appear at the Country-Night Gstaad, Switzerland, (9-11 September 2011), according to their tour schedule. At the 2010 IBMA Awards Show, Dailey & Vincent received the awards for Entertainer of the Year, Vocal Group of the Year, and Album of the Year, and shared in the awards for Recorded Event of the Year and Best Graphic Design for a Recorded Project. They have been nominated for nine awards in next month's SPBGMA convention. The Bluegrass Show on Country Radio Switzerland is presented by the Swiss Bluegrass Music Association (SBMA) and Acoustics Bluegrass Records. Have fun with the SBMA and streaming radio from Switzerland! 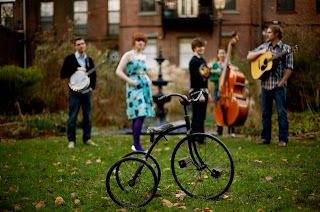 The Boston-based 'modern string band' Joy Kills Sorrow (USA) has just ended a series of shows in Denmark and will play five shows in the Netherlands before taking part in the Celtic Connections festival in Glasgow, Scotland. On 26 January they return to the Continent for two more shows in the Netherlands and eight in Germany and Austria. Their European tour concludes with six shows in Ireland (7-12 February). Full details are on their tour schedule. 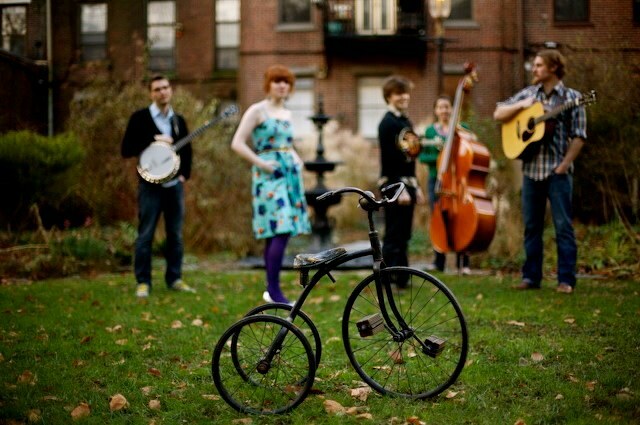 Joy Kills Sorrow, which has both stylistic and personal links with such bands as Crooked Still and the Biscuit Burners, consists of Matthew Arcara (guitar), Jacob Jolliff (mandolin), Wesley Corbett (banjo), Emma Beaton (vocals), and Bridget Kearney (bass and songwriting). The band is also on MySpace and Twitter. The London-based folk, roots and world music monthly magazine fRoots, established in 1979, has for decades carried an annual festival supplement in its April issue - its biggest seller each year, and a widely used source of information on Europe's folk, roots and world music events. The supplement, which appears in both print and digital subscription editions, always includes a free diary listing with basic details of as many folk, roots, and world music festivals and traditional events in Europe as possible. The April issue appears in mid March, and the deadline for delivering data is 8 February. From 2011 fRoots will be collaborating with Spiral Earth (who have also published a folk festival directory in conjunction with the Association Of Festival Organisers) to produce the definitive listing site for UK and European folk, roots, and world music festivals, accessible from the existing URLs on all three sites, and widely promoted. To have a free diary listing for your festival, send an e-mail to fRoots not later than 8 Feb. 2011, with the subject heading 'fRoots FREE Festival Listings: 2011 update needed', with information arranged as shown below. Artist lineups and programme details cannot be included in the free diary listing, but can appear in the news section of the fRoots issue for the month of your event, if a separate press release is sent in by around the 15th of the month that is two months before your event (i.e. 15 April for June events, 15 June for August events, etc.). Press releases and other news can be sent to the fRoots news editor Sarah Coxson by e-mail. Hi-res colour photos of participating artists can be sent to fRoots here. To advertise in the fRoots festival supplement, see the magazine's website or e-mail. 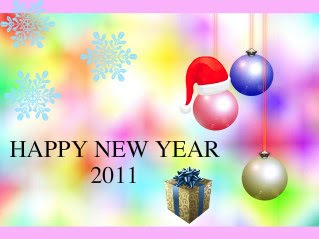 Thanks to Thierry Lecocq of Blue Railroad Train (F), who sends a big BONNE ANNEE 2011!!! and the news that he and two bandmates, Jean-Marie Redon and Sharon Lombardi, have been invited to join violinist Gilles Apap and the Pasdeloup Orchestra at 20:30 on 29 January at the Théatre du Châtelet in Paris, in a concert to celebrate the orchestra's 150 years in existence. 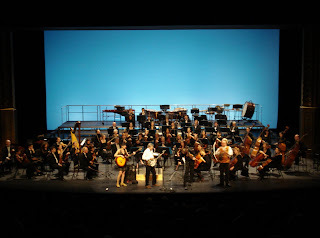 It is the oldest symphony orchestra in France. 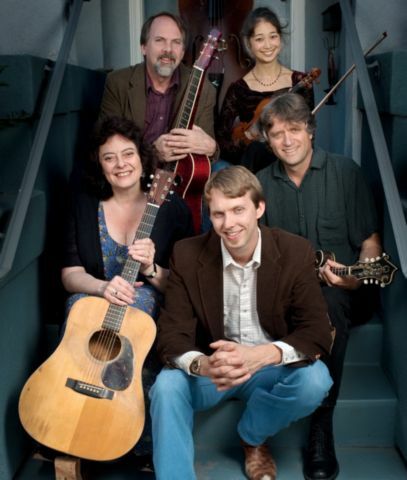 This is the latest in a series of collaborations between M. Apap and the members of BRT, several of which have been previously reported on the European Bluegrass Blog. Sat. 12 Feb. 2011 Restaurant Lerchenberg, Lerchenhalde 2, Zurich, Switzerland, 8.00 p.m.
Sun. 13 Feb. Jufa, Peter Merian-Strasse 30, Basel, Switzerland, 5.00 p.m.
Mon. 14 Feb. Clubheim, Sandbergweg 17, Vohringen, Germany, 8.00 p.m.
Tues. 15 Feb. 't Veurhof, Zuiderdiep 71, Valthe, the Netherlands, 8.00 p.m.
Wed. 16 Feb. Cafe Vriendschap, Wadway, Wognum, the Netherlands, 8.00 p.m.
Thurs. 17 Feb. Haus Opherdicke, Dorfstrasse 29, Holzwickede, Germany, 8.00 p.m.
Fri. 18 Feb. Stone Valley Music, Hotel Zalencentrum 't Zwaantje, Zieuwentseweg 1, Lichtenvoorde, the Netherlands, 8.30 p.m. Sat. 19 Feb. Bürgerhaus Neuer Markt, Europaplatz, Bühl, Germany, 7.00 p.m.
Further details, including links to maps and posters, are on the band's website. Richard F Thompson of the BBMA reports that Uncle Art, Alan John Britton’s biography of the influential English A&R man and record producer Art Satherley (see this earlier post on the EBB) is now available. Satherley's story is told in full for the first time in Uncle Art by a fellow Bristolian and musician. 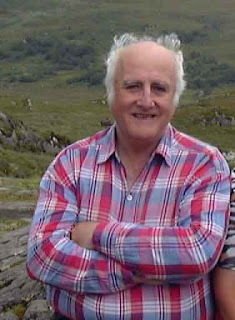 Published by Authorhouse UK, the 232-page book includes an introduction by Forrest White, who had first planned to write a biography of Satherley. Britton, who had access to White’s papers and recorded interviews, includes his own background and the discovery of this fascinating story, beginning with Satherley's childhood and schooling, and some history of Bristol and the important role that the city's port played in the movement of settlers and trade to the New World. The book also includes many photographs and the lyrics to the song 'Uncle Art', written by Britton and Pete Willington. Anyone who orders a hardback copy from the author will receive a complimentary audio CD of the song. The book is also available from the publisher, Amazon.com, Amazon.co.uk, and Barnes & Noble. Announcing... New Cuts of Bluegrass!!! New Cuts of Bluegrass is a service designed to deliver the latest releases from the bluegrass world to radio stations, DJs and programmers. 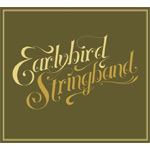 Each month New Cuts of Bluegrass will compile song releases from major labels, independent labels as well as independent artists on one CD. These compilations will be mailed to over 400 radio stations including traditional, internet and satellite broadcasters. New Cuts of Bluegrass comprehensive distribution ensures an efficient way to get new music into the hands of Bluegrass Radio. 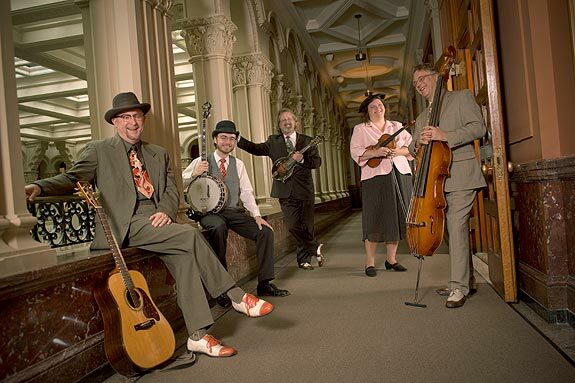 Contact New Cuts of Bluegrass today to be included in next month's issue! The end of the year was marked by several changes in the lineup of Czech and Slovak bands. 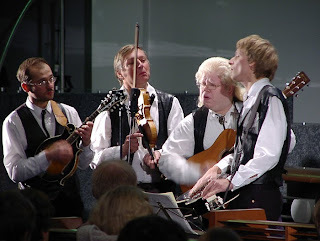 Ondra Kozák (guitar, fiddle; right in above photo) left the Petr Brandejs Band as well as the Kreni and is now only member of Fragment, which is working on a US tour in 2011. Vilma Orlitova (bass; centre in above photo) also left the PBB to concentrate on raising of her four children. Henrich Novák (dobro) and his band Grass Country (later renamed Natalia Mikuskova & the Keepers) announced in the fall that the frontman and singer Natalia is leaving the band. Hopefully all these changes will lead to more new and interesting bands. One new and promising, named Who's your Daddy?, consists of Zdenek Roh (banjo, vocals), Henrich Novák (dobro, vocal), Martin Vitasek (guitar, vocals), Vladimir Krizan (guitar), and Erik Banic (bass). Michael Cleveland & Flamekeeper played in December for a full house of the theatre Kopernik in Prague as a part of the Bluegrass Jamboree tour. Invited by the luthier Rosta Capek, they even played his mandolins and banjo in one song. Rosta is preparing a show of two phenomenal mandolinists (above), Mike Marshall (USA) and Catarina Lichtenberg (D), accompanied in a part of the program by Petr Brandejs (banjo), Ondra Kozak (guitar), Stano Paluch (fiddle), and David Koucky (bass). 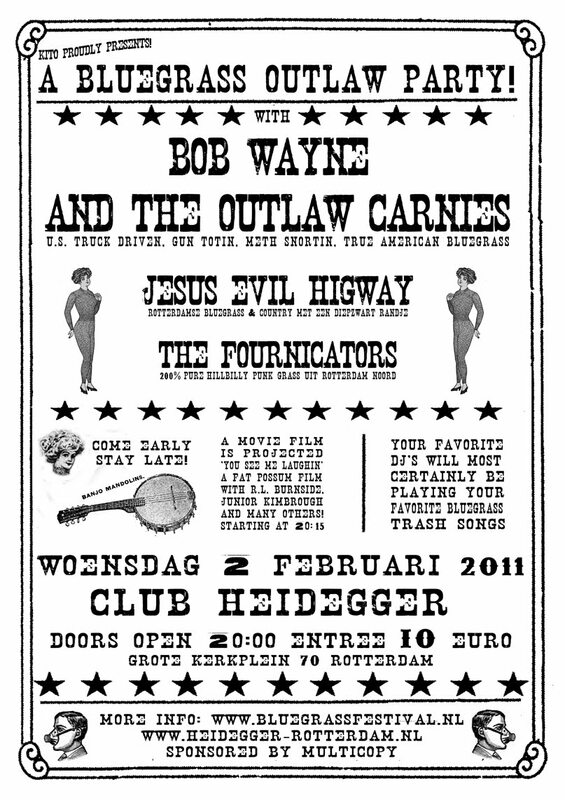 The show is announced for 22 February at the same venue. For more information visit the Capek instruments website. Petr Brandejs's 6th winter workshop, which takes place in Novy Jicin on 4-6 March, sells fast. For more info e-mail. Thanks to the band Monogram, Doyle Lawson & Quicksilver are coming to Prague on 16 May 2011. Bluegrass Music Denmark closed out our 2010 concert series with the annual Bluegrass Night on 26 November. We had a very good turnout, in spite of a terrific snowstorm. The concert featured three groups: the No Hard Times Bluegrass Band from Sweden, Rocks & Ivy from Belgium/Holland, and the Strings Alive band. Rocks & Ivy put on a fine show after a gruelling drive on snowy and icy roads here in Denmark. 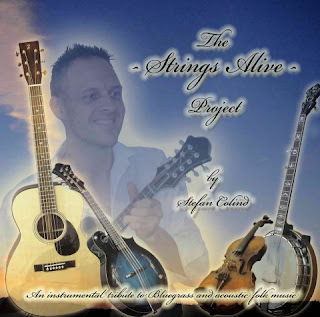 The Strings Alive band played several numbers from BMD board member Stefan Colind's new CD, The Strings Alive Project. Stefan's project consists of 14 original instrumental numbers, with a lot of interesting 'twists'. 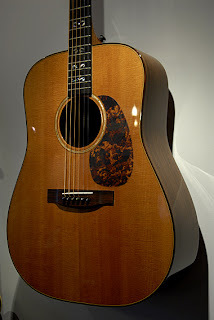 More information is available on the Strings Alive website. For the occasion, Jesper Rübner-Petersen came 'home' from Germany to play guitar, and Thomas Haglund came down from Stockholm to play fiddle, as they do on the CD. Jesper Rübner-Petersen's book The mandolin picker's guide to bluegrass improvisation, from Mel Bay Publications, has received a lot of good reviews. It was good to see him back in Denmark at the Bluegrass Night. Our spring concert series is set, and includes Downtown Ramblers from Sweden, and Special Consensus from USA, as well as several Danish groups, and we look forward to a fresh new year - 2011. 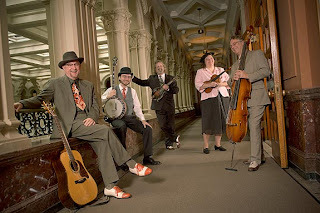 Christopher Howard-Williams of the France Bluegrass Musique Association reports that the headline acts for this year's La Roche Bluegrass Festival (3-7 August 2011), at La Roche-sur-Foron, Haute Savoie, France, are booked. They are the Kathy Kallick Band (USA; left); Hickory Project (USA); Sue Thompson with James Field and Petr Brandejs; G-Runs 'n Roses (CZ); Bluegrass 43 (F); and Howlin' Fox (F). Invitations to apply to play the festival will go out during January, and the organisers hope to finalise the full lineup by mid March 2011. Lilly of the West is currently in the studio, recording a new album with country and jazz standards from the 1940s/50s. 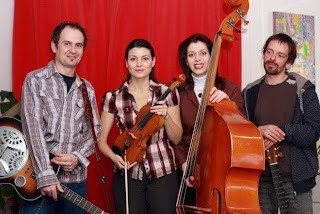 The band features Lilly Drumeva (lead vocals, guitar, fiddle, mandolin), Yasen Vasilev (guitar), Misho Shishkov (Dobro, harmonica), Bodi Bozduganova (upright bass). And more to come: please check the website. 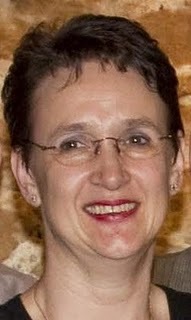 Lilly Drumeva started a new radio show on 1 January 2011, called 'In the mood with Lilly'. It airs every Saturday between 16:00 and 18:00 on Radio Sofia, 94.5 FM. Music genres include rock'n roll, rockabilly, rhythm & blues, soul, country, bluegrass, and swing. Lilly hosts also her weekly country & bluegrass show, called 'Country with Lilly' every Monday between 19:00 and 21:00, also on Radio Sofia. Every Saturday at 14.30 she presents her country music show on Balkan Bulgarian Television. For two years now Lilly has been playing the fiddle, taking lessons from Czech masters Pepa Malina and Jiri Kralik. Lilly has also started picking the mandolin, playing an A8 Godin electro/acoustic mandolin. The Mando Hangout is a new online community for mandolin players, powered by the same tools used by the popular Banjo, Fiddle, Reso, and Flatpicker Hangouts. Officially launching on 3 January 2011, the site is already active with several hundred members participating. The Mando Hangout includes a discussion forum, live chatroom, video and MP3 archive, member blogs and photo albums, classified ads, reviews, and more. To commemorate the launch, First Quality Musical Supplies has donated a Michael Kelly Legacy FS mandolin to be given away in a month-long drawing. Visitors can enter the drawing once a day for the duration of the drawing by following the links from the Mando Hangout homepage. The January 2011 issue of the IBMA's newsletter International Bluegrass has an augmented section of European news, including many items selected from the European Bluegrass Blog and special announcements from the EBMA board of directors on the future of Bluegrass Europe, the new EBMA affiliate membership structure, and the development of a European Festival Network. Major features in this issue include the lead article on Bluegrass Nation, IBMA’s first-ever initiative to harness the power of digital media and social networking. Fully integrated into a comprehensive redesign of IBMA’s web site, Bluegrass Nation will be a community and a platform for news, information sharing, promotion, education, and all kinds of media. 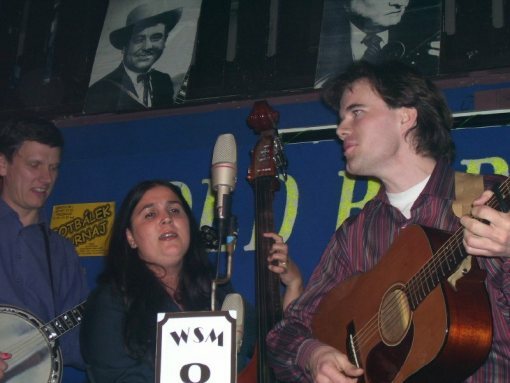 Among many other items, Nick Barr & Nancy Cardwell explore the question 'How will you celebrate the Bill Monroe centennial?'. View the whole issue here, where the newsletter can also be downloaded in PDF format.